Osteria, Marc Vetri's new restaurant on North Broad Street, doesn't look like this after 5 p.m.
A Japanese restaurant based on the formal dining style called kaiseki is about to take shape in the space at the Academy House (1420 Locust St.). Jonathan Chun, who owns Fuji Mountain on Chestnut near 21st, is behind the venture - no name yet - that he hopes to open in May. The space, once home to Marabella's, last was occupied by a short-lived barbecue outlet called the Smoked Joint. Chun says kaiseki meals, which use seasonal, local ingredients and feature stunning presentation, typically run 17 to 19 courses, but he plans to keep to five to nine courses. The photo with today's column shows an empty dining room at Marc Vetri and Jeff Benjamin's spanking-new Osteria (640 N. Broad St., 215-763-0920). It's like that only until the doors open daily at 5 p.m. Osteria has been going great guns in its first two weeks. 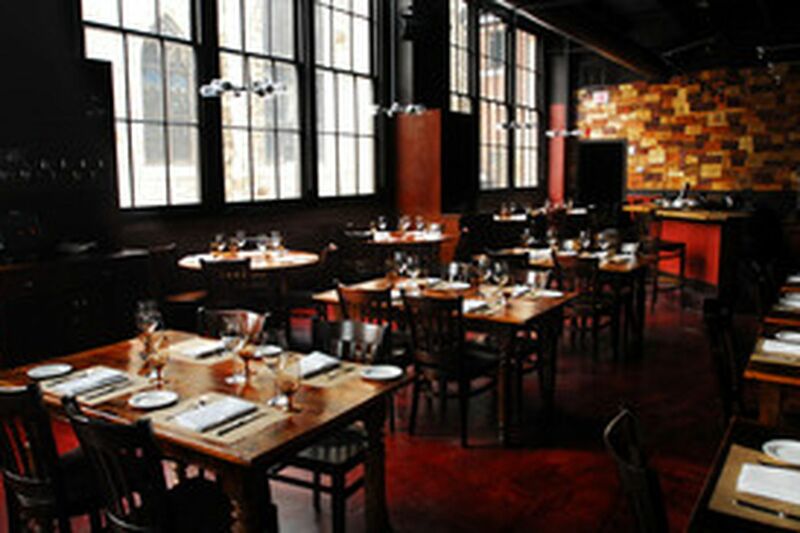 Vetri says they're taking only 120 reservations a night, lest they get too jammed. Still, many walk-ins are plopping down at the bar or the kitchen counter. Osteria, on the ground floor of a new loft-apartment building at Broad and Wallace Streets, might herald new life for the stretch of Broad just north of Spring Garden Street. There's talk that a national gourmet grocery and a local gelateria are planning spots nearby, and - for what, the hundredth time? - a plan is in the works to redevelop the Divine Lorraine Hotel a block north. (38 S. 19th St., 215-988-0089), which opened last year as a fancy hamburger-hot dog outlet, has been reconfigured into a sit-down, Mediterranean-influenced Continental restaurant open for weekday lunch (casual) and Monday-to-Saturday dinner (tablecloth). Figure on $11 to $15 for lunch entrees, $18 to $26 for dinner. The former takeout counter has been turned into a bar; there are about 15 wines by the glass as well as 15-plus specialty beers. Benny Lai of Chinatown's Vietnam is setting up Vietnam Cafe, a smaller, BYOB sibling at 814 S. 47th St. in West Philly. He says he hopes to open this summer. Another location has opened for Cheeburger Cheeburger, the burger franchise. This one's at 95 Wilmington-West Chester Pike in Chadds Ford (610-558-5880). The Kens say their Sabai Thai (3707 West Chester Pike, Newtown Square) is for sale, as they want a change. They're asking $170,000. It will stay open until it sells. The Shanachie in Ambler goes smoke-free starting St. Patrick's Day. Brad Smith is now executive chef at the Swedes Inn in Swedesboro. Menu has gone international, reflecting Smith's stops at Cuba Libre in Old City (Latin); Red Sage (Southwest cuisine) and Raku (Asian cuisine) in the D.C. area; and Red Square in Miami Beach (Russian). Forty-six South Jersey restaurants are banding for SJ Restaurant Week, March 11 to 16. List is at www.sjhotchefs.com. Ralph Pallarino, chef of Stella Blu and Gypsy Saloon in West Conshohocken, turns up at 9:30 p.m. Saturday on Dinner Date on the Fine Living network. Episode is called "Knot My Mama," and it's a cooking class in which brides-to-be and future mothers-in-law get into the kitchen.